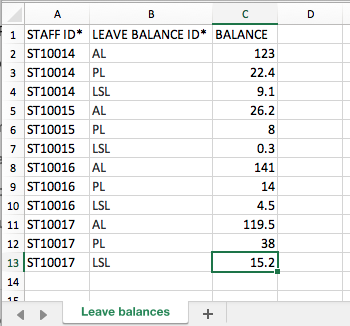 If you are using your payroll system to calculate staff leave balances then you might want to import these into Ento. 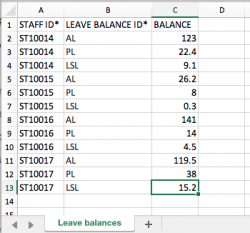 If you are using Ento to allow staff to view their balances and to be able to apply for different types of leave then you are going want to routinely export this information from your payroll system then import it into Ento. To start a new file import, go to Core HR > Account data > Import data and click Create new. Open the Type dropdown list and select ‘Leave balances’. This name may change depending on your chosen terminology. The purple bar under the file selection will then update to include a ‘Click here’ link for downloading a CSV template that includes all the fields necessary to get importing. If your payroll system exports in a format where there is only one line for each staff, with a column for each type of leave, you may be better of using a staff update import. StaffID and First name are the required fields (*as indicated by asterisk) fora staff import. Please note this should be run as an Update import, so only the leave balance fields are updated. More information on preparing Staff and other import files can be found in Importing data overview.